Rumpa Dey, a doctoral student in civil and environmental engineering, has been awarded a Faculty for the Future Fellowship. Launched by the Schlumberger Foundation in 2004, the long-term goal of the Faculty for the Future program is to inspire female scientists with both scientific talent and leadership capabilities to become role models in their home countries where women are underrepresented in science. Faculty for the Future fellowships are awarded to women from developing and emerging economies who are preparing for Ph.D. or postdoctoral study in science and engineering disciplines at top universities for their disciplines abroad. 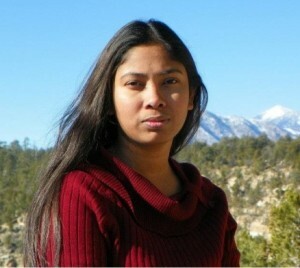 Dey, a native of Bangladesh, is one of 63 women awarded fellowships for the 2012-2013 academic year. Under the guidance of Soyoung Ahn and Mikhail Chester, assistant professors in the School of Sustainable Engineering and the Built Environment, Dey is investigating methods for improving estimations of regional vehicle fuel consumption and air emissions inventories. Among many factors, she is studying the marginal effects of road composition—for example, the percentage of freeways, road gradient, weight and traffic conditions on freeway entrance and exit ramps for greenhouse gas emissions, as well as other human health and environmentally impactful pollutants such as SOX and particulate matter. Her research will shed light on the accuracy of current practices to estimate emissions profiles and the key factors that should be incorporated to improve the accuracy. It is anticipated that the research results will better support the assessment of greenhouse gases and impacts to the environment and human health as well as decision-making aimed at improving transportation sustainability. Dey received her M.S. in civil and environmental engineering from ASU in May. She holds a B.Sc. in civil engineering from Bangladesh University of Engineering and Technology (BUET). At BUET, she was a three-time recipient of the Bangladesh Scholarship Council scholarship sponsored by Nippon Foundation Japan. After graduation, Dey joined the American International University-Bangladesh as a lecturer in the Faculty of Engineering. She has published one journal article, three conference proceedings and two theses, and attended several national and international conferences in her field. Dey says that in her free time she enjoys reading and traveling. She credits her husband as a significant contributor to her success.